Welcome, welcome our dear furiends! We are so happy that you would come and help us celebrate our First Wedding Anniversary and share in our unending love for each other. 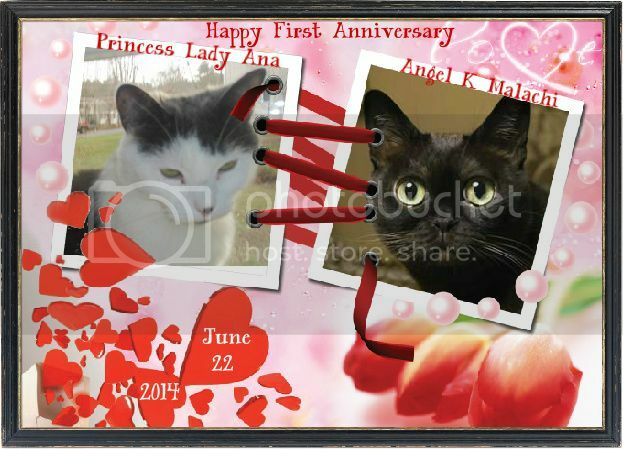 Princess Lady Ana and I met on CatChannel and started dating on St. Valentine's Day 2013. We were married on June 22, 2013. We had a beautiful honeymoon in the White Mountains of New Hampshire and local environs. I did daily blogs about what sights we saw and side-trips we made. We saw many waterfalls and quaint covered bridges. When I crossed to the Bridge on April 30, 2014, I was determined not to leave a grieving widow before our First Anniversary. I went through Angel training with ease and decided to come back down to Earth mainly to be an Earth Angel so I could be with my beloved bride. I also help my Mama with my catmail. Princess Lady Ana and I have a sprawling five bedroom house in the Biltmore District of Phoenix, Arizona. During the winter, her sisters Princess Sandy and Princess Haley come down to winter with us to get away from the Massachusetts freeze, which is where Princess Lady Ana hails from. During the summer we vacation up in Massachusetts to escape the worse of the Phoenix heat, which can get up to 119*F at times. Anyway, let's all take our seats and the waiters will serve catpagne and we can toast TO LOVE and ETERNITY. Then we will be served a delicious breakfast of Eggs Benedict or Bienville, Virginia ham, country biscuits with cream gravy, savory bacon or sausage and finish off with your choice of lime or orange sherbet. There will be dancing after breakfast and we hope that everyone has a wonderful time and thank you for coming to celebrate our love. Last update on June 22, 9:36 am by Angel K.Malachi. Every day is a good day with a Bombay! Happy 1st Weddiing Anniversary Angel King Malachi & Princess Lady Ana! We wish you both many more glorious years of happiness and joy! Thank you for gracing our home yesterday with your presence dear furiends. It was wonderful to be together with so many furiends. We’ll be back later to join in your anniversary celebration. The breakfast brunch looks and smells delicious! To Love & Eternity! Sending you soft purrs and warm hugs. Pete and the whole family found A K Malachi and Ana on the afterdeck at the Cathugger Grill. It was a beautiful day, Sunny with a light breeze. Talley, Whiskers and the whole family presented The happy couple with a special anniversary gift. A small wooden chest containing a gold signet ring set with rubies for Malachi and a golden necklace set with emeralds for the Lovely Ana. The stones and gold were part of the treasure that Pete and Whiskers had earned in helping to capture the pirate dogs who had stolen Queen Dolly's royal jewels. In addition to the stolen crown The pirate had been carrying a huge fortune in treasure. Captain Angel Sherman had divided the treasure among all those who had been aboard the Golden Kitty and The kitties who assisted from the air. Angel King Malachi looked at his ring and smiled, He knew that more than the monetary value, their gifts represented love and eternal friendship. We were on the wrong page this morning, We hope you enjoyed the sleepover! Later we will go back to our house and you can visit the school and community. Hello and happy annivesary to the happy couple. I hope you have many more. We were so happy that you could make the pawty! My lovely wife would be happy to dance with you. (Princess Lady Ana stands up and let's Chester take her hand). Look at the pawsome dancing way to go Lady Ana and Chester. It's a wonderful day for such a grand event. Princess Lady Ana has thoroughly enjoyed dancing with the dapper Chester of Catnip Island. He returns her safely to Angel K.Malachi's arms. Princess Lady Ana and Chester both call out, "Thank you for the kind compliment, Bugsy." Sorry we couldn't make it yesterday Happy Anniversary Angel K.Malachi and Princess Lady Ana! All times are GMT -5. The time now is 8:16 pm.